A number of articles appeared recently that, while making some their point, tried enumerate different meanings of the word “kanban.” I would like to show my own set of definitions that I found useful to keep in my head when facilitating understanding of improvement options in the knowledge-based workplace. 1. Kanban as a permission-giving signal. Kanban is a signal that gives someone permission to start doing something. An example of this is the token system used by the Imperial Palace in Tokyo, documented in David Anderson’s Kanban book. My children’s elementary school limits the number of parents that can be inside the school observing their children’s classrooms; there is a small box with visitor lanyards in the principal’s office. I have seen an example of a similar system in a sushi shop and how it helps sushi chefs continuously adapt to variable demand. These and other examples I have seen suggest that such signaling concept originated in Japan and possibly dates as far back as the 17th century. A simple virtual kanban board. In its current state, the board is sending one permission-giving signal (to pull an item from the Backlog into To Do). 2. Kanban as a virtual permission giver. People familiar with kanban in physical contexts (1st meaning) may find it very difficult to locate the permission-giving signals on a Kanban board in an office today. This is because the boards visualize an invisible process and use WIP limits to create virtual kanban and use them as signals. 3. Kanban system comprising multiple steps in workflow joined together by permission giving signals (1st meaning). This concept is popular in manufacturing and logistics, where you can use kanban signaling to create a pull system for your assembly process or supply chain. 4. Virtual kanban system based on virtual kanban signaling (2nd meaning) in the office. People familiar with kanban system in physical environments, such as manufacturing and logistics, may not recognize virtual kanban systems in knowledge work. You can tell a virtual kanban system on a whiteboard or in an electronic tool by observing consecutive columns with WIP limits. Virtual kanban signals (2nd meaning) cannot propagate through columns with infinite limits (called “buffers”). Infinite buffers, if they exist, divide the value stream into multiple virtual kanban systems. Such kanban systems can be used to manage work in fields such as software engineering, graphic design, marketing communication, product development, entrepreneurship and many others. 5. Kanban as an evolutionary improvement method for the knowledge-based workplace. The method includes virtual kanban systems (4th meaning) as a way to implement one of its core practices: limit work in progress. It also has a definition including four principles and six core practices, a depth model, and a body of knowledge on how to apply it, emphasizing service orientation, organizational improvement focus and certain behaviours of coaches and change agents. The existing definition and knowledge of Kanban makes it an appropriate method for evolutionary improvement of knowledge-work organizations, which is known to be a Complex-domain problem. Of course, it is not the only method suitable for this class of problems. 6. Kanban the information radiator. Writing work items on post-its and sticking them to the wall is mostly a misinterpretation of the virtual kanban system concept. I’m including it here because it persists, unfortunately. Popular literature adds to this misunderstanding from time to time, the latest example being The Phoenix Project (which is generally a recommended book for IT and software professionals as its positives outweigh this and several other flaws – but this is a topic for another blog post). 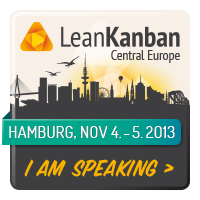 People who have discovered this meaning of kanban are encouraged to explore other meanings. 7. The Kanban community. The last several years saw the emergence of a new community. Many participants may have joined it to learn more about Kanban systems (4) and the Kanban method (5), but their inquiry has broadened to include Lean, complexity and cross-disciplinary connections. 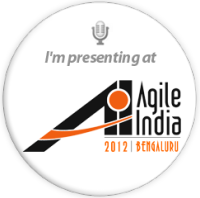 The result was fast development of Agile innovations that are useful to many, whether they use Kanban (5) or kanban systems (4) or neither. Examples of such innovations include Håkan Forss’ adaptation of Toyota Kata to the IT world, Troy Magennis’s work on Monte Carlo techniques for software project risks, and Jeff Anderson’s Lean Startup for Organizational Change. One can participate in this community at intermediate and expert levels at conferences or at introductory and intermediate levels using local groups that go by the name Limited WIP Society. Participation in this community correlates with one’s ability to interpret this fast-evolving knowledge as well as the ambiguous terminology. Kanban (7) can thus be their gateway to innovation whether they use it (1-5) or not.